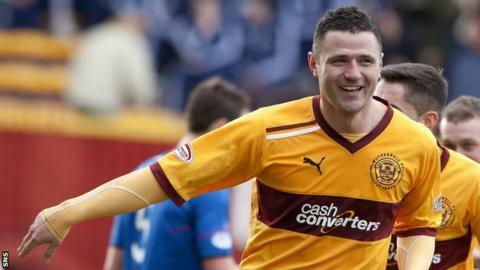 Michael Higdon hopes Motherwell will make the most of that allowed them to leapfrog the Highlanders into second spot in the Scottish Premier League. The 29-year-old Liverpudlian scored twice in the 3-0 triumph over Terry Butcher's side to take his SPL tally to 15 for the Steelmen this season. Now he wants Well to build on that win, with Dundee United visiting in midweek. "We want to carry on the way we are going," said the striker. "We're in a good position and have a couple of games in hand on the teams around us. "It's good we have a game coming up on Tuesday because we would rather play than train, especially when we are on winning form. "We just want to go out and express ourselves, and I thought we did that [against Caley Thistle] with some outstanding performances." Higdon's brace - a tap-in and a spectacular left-foot volley - means he has now scored six times against Inverness in the current campaign. The former St Mirren striker will surely be a first pick for manager Stuart McCall for the match against Jackie McNamara's Dundee United as they attempt to move five points clear in second. Motherwell's lofty position owes much to their impressive home form, with four wins and a draw from their last five league games at Fir Park. Their bid to finish SPL runners-up is likely to be boosted by forward Kallum Higginbotham, on loan from Huddersfield, who made his first start for the Steelmen against Inverness and produced a cultured display. McCall said: "He got off to a good start, a great effort. "He did a lot of good things, playing in a similar role to Murphy. We showed him clips of how Jamie had played up at Inverness, just in an area of a park we can try to exploit at times. "He can play in that area just off the front and slightly to the left."